London: 16 August 2012 - ECR Minerals plc is pleased to announce that it has executed a financing package with YA Global Master SPV Ltd (“YA”) to raise approximately GBP 1.3 million before costs. an advance under ECR’s Standby Equity Distribution Agreement (“SEDA”) with YA raising GBP 150,000 before costs by the issue of 25,070,902 Ordinary Shares at a price of 0.5983p per share. ECR’s rationale for entering into the Equity Swap is to allow the Company the opportunity to benefit from increases in its share price above the level of the Benchmark Price during the period of the Equity Swap, subject to the parameters described below. The net proceeds of the financing package will be used to support activities at ECR’s 100% owned Sierra de las Minas gold project in Argentina, including the planned underground sampling programme at the El Abra prospect described in the Company’s announcement of 7 August 2012; to repay an amount of USD 409,610 that remains outstanding pursuant to the USD 1.5 million loan obtained from YA in August 2011; and for general corporate purposes. “This substantial financing package will fund ECR for the planned underground sampling programme at the El Abra gold prospect in Argentina and sustain the Company while work continues towards the monetisation of some of its other assets, including its interest in the ACS Asia manufacturing business. It is also ECR’s intention to dispose of a significant part of its interest in THEMAC Resources Group, but if this is to occur on advantageous terms it is essential to be working from a position of some financial strength, which the arrangements announced today allow us to do. The implication of the Equity Swap is that if the ECR share price exceeds the 0.66p Benchmark Price by a sufficient margin, the Company will receive extra funds, which would clearly be to the benefit of shareholders. The chosen Benchmark Price was approximately the prevailing price of the Company’s shares on AIM at the time the terms of the Equity Swap were agreed. The principal amount of the Loan is USD 1 million. This amount is due to be repaid in twelve tranches, with the final repayment due in July 2013, however the Company has the right to repay the Loan early if desired. Interest at a rate of 10% per annum on the outstanding principal amount is payable with each repayment tranche and an implementation fee of 10% of the principal amount has been paid to YA out of the Loan proceeds. The Loan is secured over listed securities held by the Company and under the SEDA, the validity of which has been extended until April 2014. YA has the right to convert the outstanding amount of the Loan into Ordinary Shares at any time based on a price of 0.729p, being 150% of the volume weighted average price of ECR shares on AIM for the five trading days prior to the date the Loan was agreed. YA has subscribed for 75,757,575 Ordinary Shares at a price of 0.66p per share, raising GBP 500,000 before costs. In addition, ECR has entered into the Equity Swap with YA in respect of the same number of Ordinary Shares. The period of the Equity Swap is approximately 12 months. The Equity Swap provides for monthly payments to either the Company or YA depending on the performance of the ECR share price in relation to the Benchmark Price of 0.66p. It also entails GBP 250,000 of the Subscription proceeds being placed into escrow and envisages this amount being released back to ECR in 12 equal monthly instalments (each a “Monthly Instalment”). In a given month, the figure that is 90% of the average of the lowest ten daily volume weighted average prices for ECR shares on AIM shall be deemed to be the market price of the shares (the “Market Price”) for the purposes of the Equity Swap. If the Market Price for a given month is greater than the Benchmark Price, then in respect of a certain number of shares (the “Applicable Share Amount”), YA will pay to the Company a proportion of the difference between the Market Price and the Benchmark Price. If the Market Price exceeds 2p, this proportion will be increased. Any such amount would be received by ECR in addition to the relevant Monthly Instalment, and there is no upper limit on the additional amount that may be received by the Company pursuant to the Equity Swap. If the Market Price for a given month is less than the Benchmark Price, then in respect of the Applicable Share Amount, ECR will pay to YA the difference between the Market Price and the Benchmark Price. In practice any such payment would be satisfied first by deduction from the relevant Monthly Instalment, however if the Market Price were less than half the Benchmark Price, the amount due to YA would exceed the relevant Monthly Instalment. ECR would therefore not receive the Monthly Instalment and would be required to make a payment to YA. The Applicable Share Amount will be 6,313,131 Ordinary Shares, being one twelfth of the total number of Ordinary Shares subject to the Equity Swap, unless YA elects to shorten the duration of the Equity Swap and proportionally increase the Applicable Share Amount and the amount of the Monthly Instalment. YA has the right to terminate the Equity Swap early and accelerate all the payment obligations, and under certain circumstances, for example if the Company is in material breach of any its obligations to YA, other methods of determining a Market Price for the purposes of terminating the Equity Swap may be applied. Under no circumstances can YA require ECR to issue any additional shares pursuant to the Equity Swap, and YA and its affiliates are prohibited from holding any net short position in ECR shares. A commitment fee of GBP 50,000 is payable by the Company in connection with the Equity Swap, and of this amount, GBP 25,000 is payable immediately and has been settled by the issuance of 3,787,878 Ordinary Shares at the Benchmark Price. The remainder of the commitment fee is payable six months from the date the Equity Swap was agreed or on termination, whichever is the earlier. Pursuant to this announcement application has been made for a total of 104,616,355 new Ordinary Shares to be admitted to trading on AIM. Dealings are expected to commence on 20 August 2012. The new Ordinary Shares will rank pari passu in all respects with the Ordinary Shares of the Company currently traded on AIM. Following admission, the Company’s issued share capital will consist of 910,092,928 Ordinary Shares. The Company does not hold any Ordinary Shares in treasury. Therefore the total number of Ordinary Shares with voting rights is 910,092,928. The above figure of 910,092,928 Ordinary Shares may be used by shareholders in the Company as the denominator for the calculations by which they will determine if they are required to notify their interest in, or a change to their interest in, the share capital of the Company under the Financial Services Authority’s Disclosure and Transparency Rules. YA is advised by Yorkville Advisors, which is an investment manager headquartered in Jersey City, New Jersey, USA. Yorkville is active across North America, Europe and the Asia-Pacific region, and operates in the UK through its affiliated entity Yorkville Advisors UK LLP. ECR is a mineral development company with the following main projects and interests. 100% ownership of the Sierra de las Minas gold project in La Rioja Province, Argentina, where the Company’s strategy is to work up small, high grade gold targets that may be suitable for early advancement to production. ECR has completed an initial drill programme at the El Abra gold prospect with promising results (best intersection 3.9m downhole at 11.6 g/t gold including 0.2m at 109.1 g/t gold) and is moving to follow up these results with a programme of underground sampling within historical workings. A 21% fully diluted stake in THEMAC Resources Group Ltd (TSX-V: MAC), which is focused on the development of the Copper Flat copper-molybdenum-gold-silver porphyry deposit in New Mexico, USA to production. THEMAC has completed a prefeasibility study (PFS) for Copper Flat that indicates a pre-tax IRR for the project of 36.2% and a pre-tax NPV of USD 388.5 million at an 8% discount rate, based on July 10 2012 metal prices and initial capital costs of USD 297.7 million. 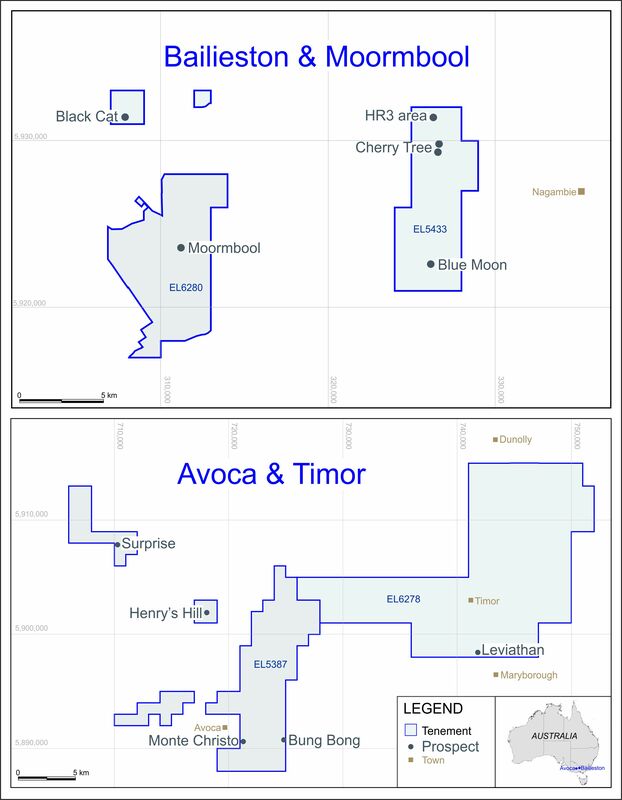 Shareholdings in West Wits Mining Ltd (ASX: WWI) and Paniai Gold Ltd (unquoted), both of which have interests in the Derewo River gold project in Papua, Indonesia, the objective of which is to establish a modern alluvial gold mining operation on a 40 hectare mining licence and to explore a number of exploration licences for new deposits.